By the time he graduated from New York University, Ed Doerr found his first success as a published writer when his short story “Fran’s Necklace” appeared in the launch issue of the San Francisco-based literary magazine Cosmopsis Quarterly. From the moment he saw his name in print, Ed knew that he wanted to continue pursuing his dream of writing, which originally took form when he was in just third grade and penning his first adventure novels to circulate amongst curious fellow classmates. A pioneer in the field of self-publishing, Ed printed his novels clandestinely, using school and library computers, before binding them by hand using glue and card stock. Also on the assembly line were his first and biggest fans: his mom and grandmother. On the road to his first publication, Ed also wrote for his high school newspaper, where an original story, called “The Mind of the Eradicator,” attracted the attention of his editors and advisor. It tells the story of a family of pencils banding together in the face of certain demise: that is, the business end of a sharpener. And just like that, Ed’s style would find its birth as he blended absurd comedy with unexpected pathos. Since the publication of “Fran’s Necklace,” Ed has had several of his poems, short stories, and essays published in various print and web publications. He has honed and deepened his love for and appreciation of literature in his role as a middle school English teacher. It is his hope to have a student of his own one day who shuffles timidly, as he once did, into class with his or her homemade books, equipped with a sign-out sheet, a clipboard, and boundless enthusiasm. His short story “Comfort Food” is now available for sale as a back issue at One Teen Story. If you have an Apple iOS device, you can download the One Teen Story app and purchase a digital copy of the “Comfort Food” back issue. Ed has recently completed a comedic young adult novel and has begun querying agents, even as he finds himself in the midst of several poems, short stories, and essays. 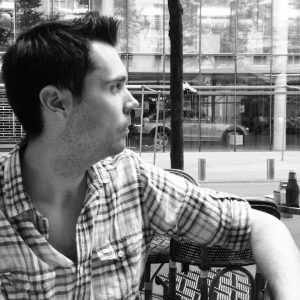 Recently, he completed his masters degree in creative writing from Fairleigh Dickinson University. 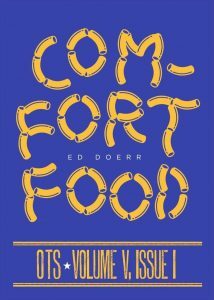 Currently, Ed has begun to work on his latest young adult project: a heartfelt but comedic novel that expands upon the situation and characters he introduced to us in “Comfort Food.” Ed also loves writing about television on his blog Overstuffed DVR.